I have found another spotting game for you to solve. Do you really like them so much? I got this impression from emails I receive. 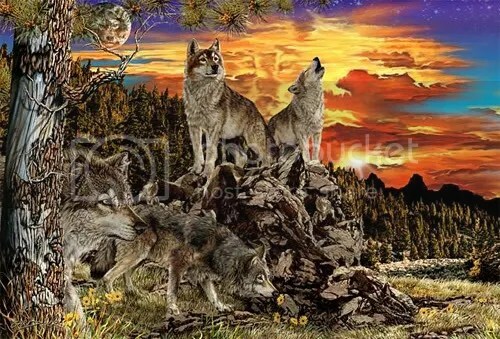 Today, your assignment is somewhat harder: try and find 17 wolves in the picture below. Some can be easily seen, but few of them are real experts in hiding themselves. Yeah, I know we had wolves before (… and previous to that). But this one was so beautiful I just had to share it with my friends – at least I hope I can call you that 🙂 The artwork was done by Steven Michael Gardner, but you can probably recognize his works by now. We had so MANY of them here. He is truly an amazing artist. Check out more of his stuff inside spot the object category.